PPI inflation is on-the-run again in the EMU despite a pick-up in January. This largely stems from falling oil prices as Brent oil prices are falling at a 13% pace over 12 months, at a 36% pace over six months and at a 69% annualized rate over three months. This sort of weakness tends to impart weakness to other commodity prices and to dominate the overall price index that contains oil and natural gas. So it is this month as well as Brent prices perked up for the month and bumped up the PPI. 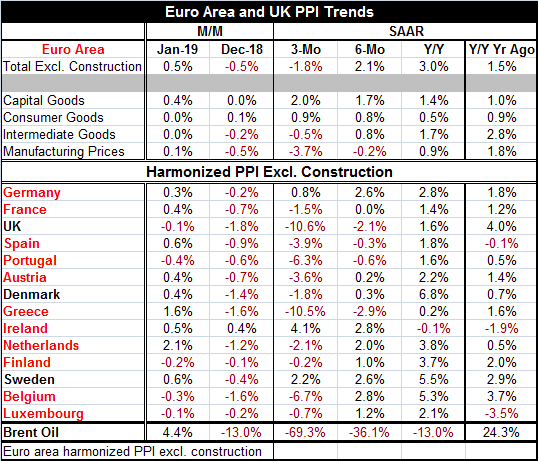 In January the PPI headline (excluding construction) gained 0.5% after a 0.5% decline in December as Brent oil prices sprang back to gain 4.4% in January after plunging by 13% in December. But one month does not a trend make… Despite this bump, the PPI remains in a downtrend. This month PPI prices fell in only five of fourteen countries in the table. However, this is just one month after the PPI fell in 13 of 14 countries. And in only three countries this month did the gain in prices in January exceed the drop posted in December. That hardly marks January as a turnaround month at least not by itself. For the 14 countries on the table (11 of them EMU members), inflation is decelerating period-to-period over three months compared to six months and over six months compared to 12 months and, of course, because of that, over three months compared to 12 months in all countries in that table except Ireland where inflation rises on all those horizons but does so by a sequentially diminishing margin. Over six months prices fall in only four countries (the U.K., Spain, Portugal and Greece). Over 12 months prices fall only in Ireland. And 12 months ago, the 12-month change in prices was negative only in three places: Ireland, Spain and Luxembourg, as the headline rose at a 1.5% pace. Despite the fact that a year ago Brent oil was rising at a 24% the annual rate in the current year-over-year pace accelerates from the pace of 12 months ago across all countries in the table except the U.K. and Greece. That is a reminder than oil prices have some lagged effects built into them. The sector chart on PPI trends for year-on-year price changes shows that capital goods prices have been firm and that, within the past year, capital goods price pressures are actually rising – but very mildly. Intermediate goods, with the heaviest weight from raw materials, show a cycling variability that has prices trending lower currently, with the last year’s intermediate goods prices decelerating and falling over three months. Consumer goods show a slight rising trend in the chart and, within the last year, consumer goods prices in the PPI show a slight acceleration from 0.5% over 12 months to 0.8% over six months to 0.9% over three months. This is an extremely small up-creep, but interestingly, it is an up-creep in the face of falling energy prices. However, at the country level, ex-energy prices are showing moderating trends in Germany and in France. German ex-energy PPI gains are at 1.3% over 12 months while in France they are at 0.8%. The German ex-energy PPI touched 2% in June 2018 but has not been above 2% since January 2018. However, it expanded at a pace above 2% from that point back to January 2017, while France did not hit or exceed 2% for its ex-energy index over that whole period. Germany has the lowest unemployment rate in the EMU and the steadiest growth. But even there inflation has not been able to take hold even at the producer level. Over the last eight-plus years since end-2010, ex-energy PPI inflation in Germany has averaged less than 1% per year and in France it has averaged less than one half of one percent per year. Inflation has been and remains remarkably contained in the euro area. We know that part of this has to do with the ongoing weakness in global oil prices that stems from weak global growth and new oil supplies from fracking in the U.S. in addition to the usual competitiveness pressures. Oil has come into a surplus position. The weakness in producer prices has a knock-on impact for consumer prices that also have been contained causing central banks globally to miss inflation targets. Now with global growth still slowing, there is little likelihood of higher oil prices although OPEC is trying to regain control again. This is a very difficult environment to do that and it is more difficult than it used to be with the Saudis having a need for their oil revenues and unable to be the swing producer with the same flexibility that they used to have.